The Blackdown Hills are a mid-range group of hills lying on the border of Devon and Somerset. They broadly cover some 350 sq. km extending from Wellington in the north to Honiton in the south and from Cullompton in the west to Chard in the east. The Somerset side of the hills in the north-east rise to a height of approx. 300m although on the Devon side the plateau is approx. no higher than 250-270m. 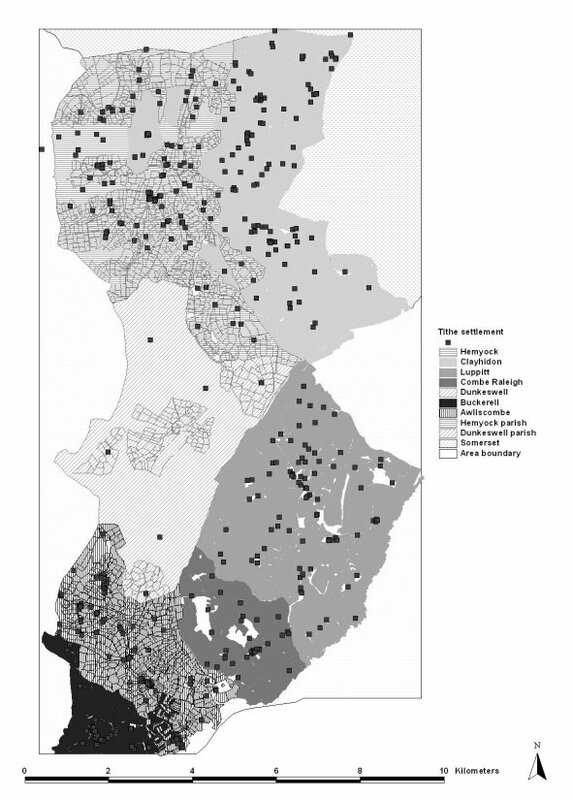 The coverage of the Community Landscapes Project study area was fixed by the grouping of parishes. Running from north to south these include Clayhidon, Hemyock, Dunkeswell, Luppitt, Coombe Raleigh, and although just off and south of the Blackdown Hills, Awliscombe and Buckerell. The nature of the Blackdown Hills is characteristically steep, wooded scarp faces to the north whilst to the south the land dips away gently as a Greensand plateau capped by a layer of clay with flints (chert). The plateau is dissected by small valleys and heavily wooded cleaves (see Findlay et al. 1984 for an introduction to the Blackdown Hills geology, soils and climate). On top of the plateau areas of open moorland still survive amongst a mainly enclosed pasture landscape with a pattern of dispersed farms and signs of late and parliamentary inclosure. In the valleys sit small villages and hamlets nested around grouped farms surrounding irregular small, enclosed fields and high-hedged lanes. Farming is the main stay of the area, mostly dairy or beef herds and/or sheep flocks. The Blackdown Hills are a prime example of an unspoilt mid to lowland landscape making it a prime area for study within this project. For more information on the ecology of the Blackdown Hills see Allen 2004. 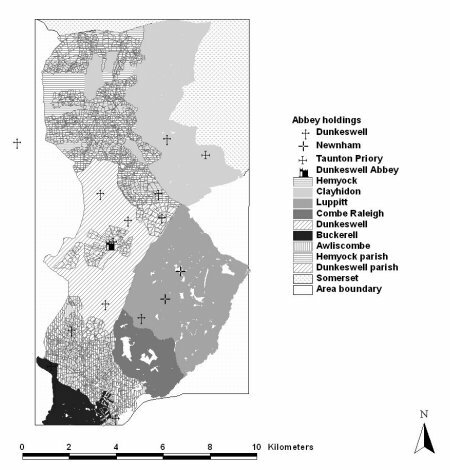 The English Heritage commissioned Environmentally Sensitive Area (ESA) survey of 1992-3 requested by the Devon and Somerset county Councils highlighted the lack of archaeological information especially on the Devon side of the hills. 1994 and 1995 saw two subsequent phases of survey primarily funded Devon County Council. This consisted of an interim survey, which aimed to build on and consolidate the understanding of previous discoveries and gain a uniform understanding of the area iron working sites, whilst then led on to a stage of design for the development of further research. Since 1994 Devon County Council have further funded the Blackdown Hills Iron working project which produced results, via pottery and radiocarbon dating, suggesting Romano-British and Saxon period iron-working in the Blackdowns (see Griffith & Weddell 1996). The nature of the actual study area is gently rolling Greensand plateau, falling away to the north and west where it is dissected by a heavily wooded cleave. The farm sits at the head of a spring to the south east of the wooded cleave, on the top of the plateau. To the south and east of the farm the lands are enclosed pastoral landscape with a pattern of dispersed farms within what appear to be primarily characteristically late in-closure. As with the majority of the Blackdown Hills all the farms included within the area of survey lie within a mainly pastoral landscape and maintain dairy/beef herds and/or sheep. The Blackdown Hills saw the Community Landscapes project and volunteers mostly in Buckerell, Awliscombe, Luppitt, Dunkeswell, Hemyock and Clayhidon carrying out palaeoenvironmental survey and earthwork survey reports. The results of the palaeoenvironmental are discussed in brief below. There is however also contained within these pages 'historical records' relating to; Awliscombe, Buckerell, Clayhidon, Dunkeswell, Hemyock , and Luppitt. This is mainly the work of the volunteers who have transcribed the 1840s Tithe Map and Apportionment records. Below is a further selection of historical records gathered by Lucy Franklin as part of her PhD. Distribution of 1086 Domesday holdings in the Blackdown Hills, East Devon. Distribution of Park fieldnames in the Blackdown Hill, East Devon. The Community Landscapes Project worked, and are still working with, many of the Luppitt history group. Below are some of the results of everyone's efforts. Luppitt Tithe Apportionments. By using the numbers its possible to cross reference and find details such as field names, use, acreage etc for every Luppitt farm on the Tithe Map.